Borrower : Foothills Housing Corp. In 1970, Foothills Housing Corp. started making improvements to single-family homes that lacked indoor plumbing and has continued to grow throughout the years. Today, the nonprofit offers services such as emergency home repair, disability ramps, and energy efficiency services for low-to-moderate income families and seniors. They also develop and manage a number of affordable housing communities in the region. Foothills, a current VCC borrower, approached us to help them purchase a single-family affordable neighborhood in Warrenton, Va., called Fletcherville. The 36-home neighborhood is located a mile north of downtown Warrenton, along Route 17. The community covers almost 28 acres, including the former “larger than life” Warrenton landmark, Ben & Mary’s Steakhouse. The neighborhood’s 36 ranch-style homes offer affordable rents for residents. 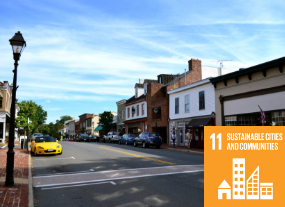 Nestled on the outskirts of Northern Virginia – one of the most expensive markets in the nation – Warrenton has a severe need for affordable housing. Foothills has shown a near half-century commitment to providing housing for people in need in this area. The organization acquired Fletcherville in late 2018 and plans to make significant upgrades to the homes and infrastructure. In a region where affordable homes are in short supply, Foothills has “helped preserve naturally occurring affordable housing in the area,” says Corbin Anderson, VCC vice president, and loan officer on the project. The acquisition of Fletcherville aligns with Foothills Housing’s 49-year mission of sustainable community development and adds to its portfolio of affordable housing neighborhoods. The project also aligns with one of VCC’s core lending areas – creating more below-market-rate homes for individuals, families, and seniors. This mission alignment and proven history with Foothills allows for a successful partnership, making Fletcherville’s rehabilitation possible. Learn more about Real Estate Lending.